Moab, UT "My Other Car is a Dune Buggy"
It's hard to choose favorites, but one of the more memorable days of our trip was in Utah. 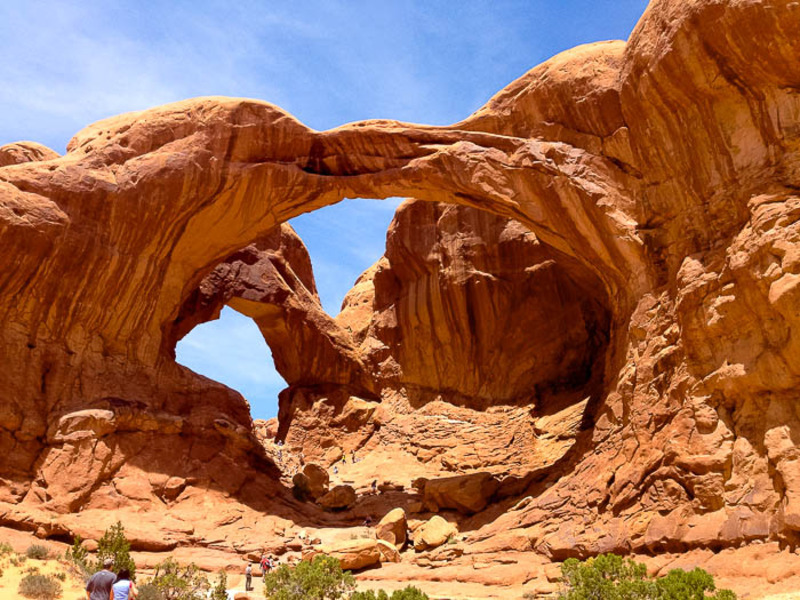 Neither of us had been to The Beehive State, but we were compelled by the suggestions on our map to explore Arches National Park and visit The Moab Brewery. We left our campground outside of Durango, Colorado to drive northwest to Utah. The landscape changed from lush mountains to dramatic desert, with red rock formations violently protruding from the earth as we neared Moab. 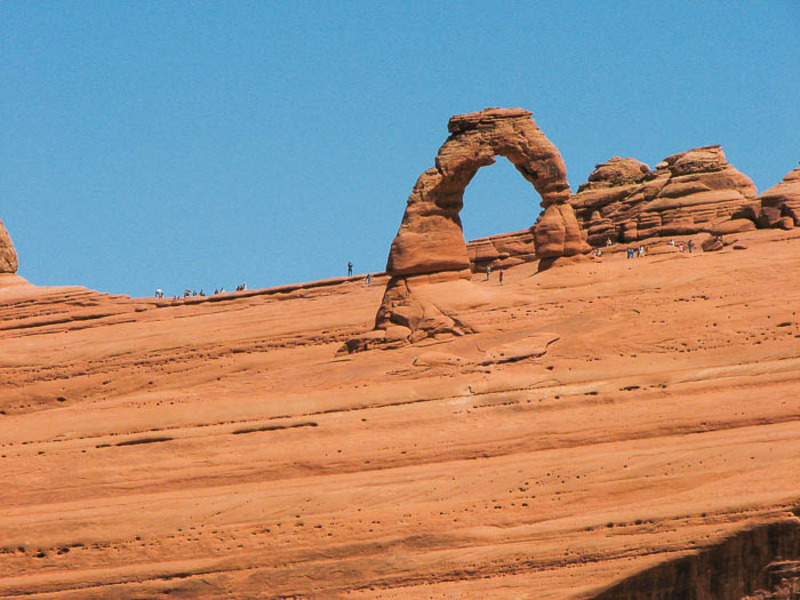 Moab is a lively little town and a popular destination for extreme sport enthusiasts that offers every imaginable kind of outdoor recreation due to the wide variety of geologic formations in the area. As we made our way to the campground at Sand Flats Recreation Area, we drove up steep winding roads sandwiched between dune buggies and Jeeps with bulky off-road tires. 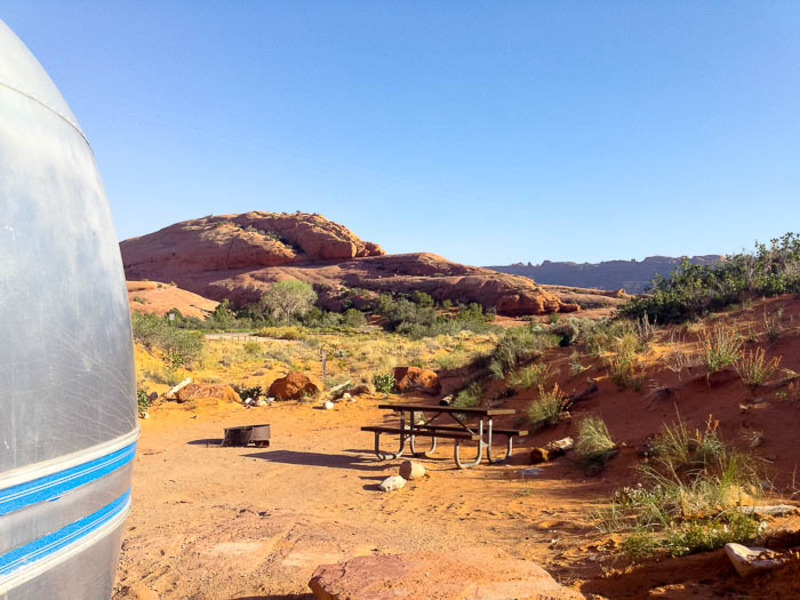 We snagged the last campsite and settled in to the rumbling of off-road vehicles traversing the slickrock around us. Our first stop was Arches National Park, just a few miles north of Moab. With more than 2,000 sandstone arches, the park has the highest density of natural arches in the world. 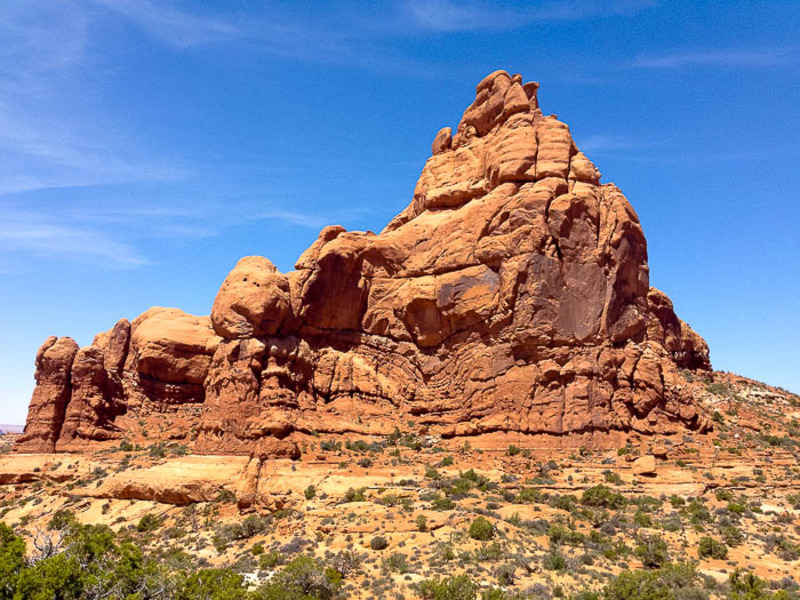 The scenic drive that winds through Arches passes by awe-inspiring rock formations: the Courthouse Towers, Balanced Rock, and the Garden of Eden. We had planned to hiking to the base of the iconic Delicate Arch, but the parking lot was packed to the brim, so we continued to the less populated Viewpoint trail. We hiked up the short trail that ends on a ridge across from the famous arch. The arch looked tiny from so far away, but we had a great view of the snow-capped La Sal Mountains and the colorful surrounding landscape. We drove to another cluster of monolithic rocks to make the short trek to the Double Arch, two giant arches that reach out like arms that create a window to the sky. We climbed up the smooth, rust-colored rock and into the belly of the Double Arch. It was incredible to be near such a monumental formation that's been slowly carved out of the Earth over millions of years. After exploring the park, we returned to the campground to find a happy-to-see-us Bulleit, our golden retriever. I had read about a swimming hole popular with locals (and dog friendly) that was just down the street. It wasn't suggested on our map, but the hot sun was beating down on our aluminum trailer and we never say no to a swimming hole. 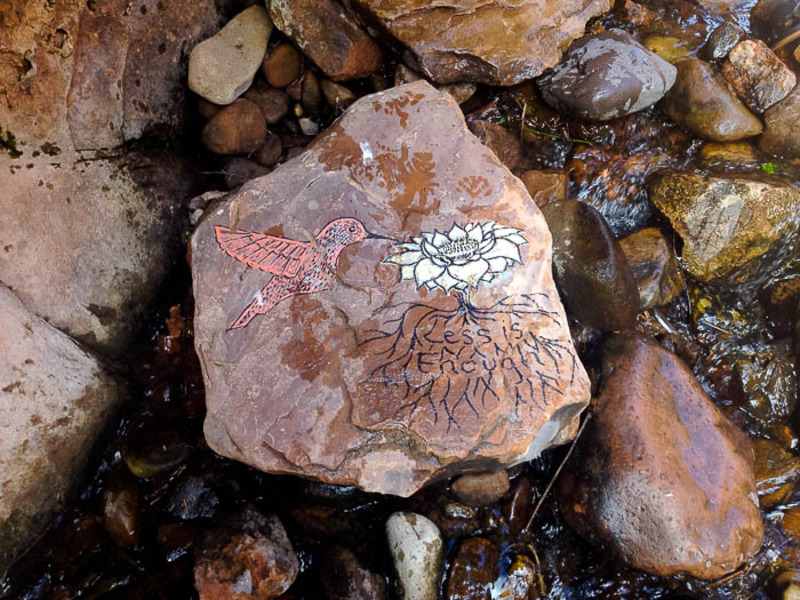 To get there, we hiked along the Mill Creek Canyon Trail that follows a babbling stream, cuts across grassy fields and hugs canyon walls. The rush of water fills the air as a clearing exposes a waterfall tumbling into a wide swimming hole surrounded by tall rock walls. 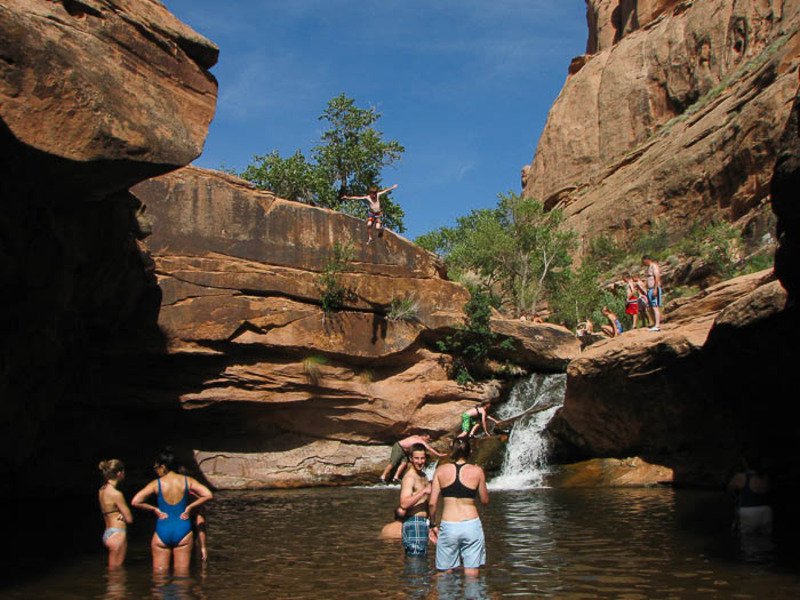 People young and old were wading in the idyllic pool and jumping off the cliffs above into the deepest waters. We slowly acclimated to the chilly water before giving Bulleit what we assumed was his first swimming lesson. After mustering up the courage, we both took turns climbing up the waterfall, leaping off the cliffs and plunging into the pool. We spent all afternoon enjoying the paradisiacal hidden oasis. After a full day in the sun, we were thirsting for a locally brewed craft beer. 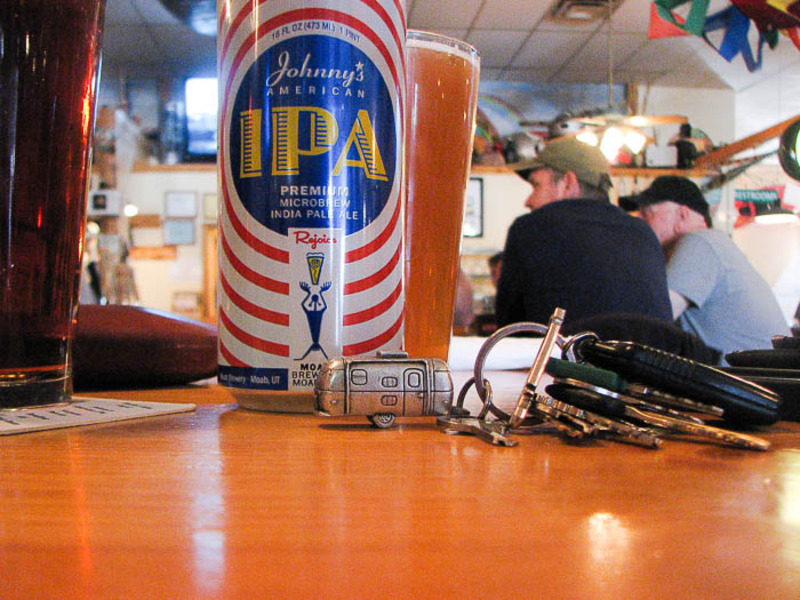 The Moab Brewery was packed, but we managed to find a pair of bar stools at a communal table. We ordered a couple of brews and struck up a conversation with a friendly English couple sitting next to us, sharing travel stories and bonding over an appreciation for the beauty of the American Southwest. Without the suggestions and encouragement from the people who visit our website, we might have overlooked Moab. But we were pleasantly surprised. Everyone there takes full advantage of the unique natural surroundings and there's a strong emphasis on being active and enjoying the great outdoors, which we found refreshing. We are constantly pinching ourselves; it's hard to believe this is our lives sometimes. Every place we visit seems to be more beautiful than the last, but Moab might just take the cake. Special thanks to lauren b. (who suggested Grab a beer.) 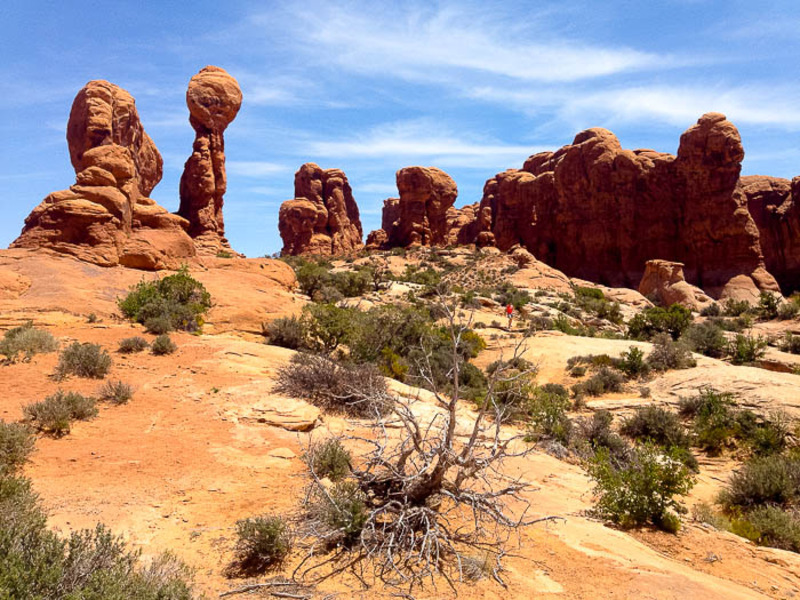 and Katy G. (who suggested Hike to Delicate Arch) for making this blog post possible!